God answers prayers! Recent research in the recovery of surgery patients for whom others prayed seems to validate this. Our experience suggests it is true. The Bible promises us that it is so. 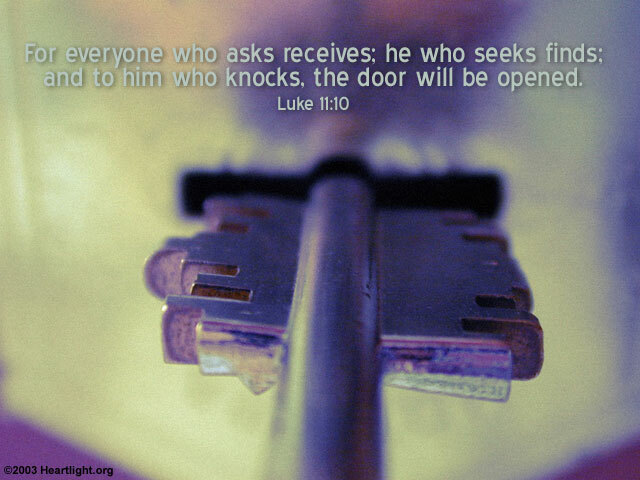 But Luke emphasizes one specific answer to prayer that God-seekers receive. God longs to give us a truly great and wonderful gift: his presence in us through his Holy Spirit. (vs. 13) Because of the indwelling Spirit, God can do unimaginable things for us and through us. Loving Father, the sacrifice of your Son for my sins is a truly incredible gift. The blessing of salvation through Jesus is more wonderful than words. The gracious gift of your presence in me through your Holy Spirit is comforting and empowering. Thank you for your assurance that as I seek you, you are eager to bless me. In Jesus' name I thank and praise you. Amen.